This is it! You’re looking at the production-ready Civic Type R. At last! Its numbers, then, what are its key stats? Power from the 2.0 litre VTEC mofo engine is rated at 310PS (228kW) at 6500rpm, while peak torque is 400Nm at 2500rpm. A lot for a front-wheel drive hot hatch, yes, but it’s what we’ve come to expect these days. The 0–100km/h sprint is all over in 5.7 seconds and the new Type R has a v-max of 270km/h. Thankfully that’s all done via a proper 6-speed manual transmission as well. The marketers have triumphed with the naming of the magic +R button. When that button is pressed the lab coats have ensured the car becomes more responsive with a more more aggressive torque-map, reduced power assistance for the steering and stiffening up the Adaptive Damper System by 30 per cent. Marketing very much triumphs over engineering with the GT pack, which is nothing more than a collection of frilly options. There’s no extra power or suspension beefiness to be found here. And speaking once again about marketing, Honda has published a video of the Civic Type R lapping the Nürburgring in 7 minutes 50.63 seconds. Take that Renault! After a five year wait, 2015 sees the arrival of the world’s most keenly anticipated hot hatch, the Honda Civic Type R. Billed as a ‘race car for the road’, the all-new Civic Type R will set new standards in the high-performance front-wheel drive hatchback segment. Type R vehicles have garnered a cult following around the world and the new model more than lives up to the high expectations. A world-first application of Honda’s new 2.0 litre VTEC TURBO engine, aggressive function-led styling, and pioneering new chassis technologies combine to deliver one of the most immersive and rewarding driving experiences available in any sector. The new 2015 Civic Type R will be powered by the most extreme and high-performing engine in the 22-year history of the red ‘H’ badge, signalling the start of a new performance era for the Honda brand. At the heart of the Civic Type R is an all-new, direct-injected turbocharged 2.0 litre VTEC TURBO petrol engine, which delivers power, torque and performance figures unmatched in the front-wheel drive hot hatch segment. Peak power output is 310 PS* at 6,500 rpm, and peak torque is 400 Nm* at 2,500 rpm – both higher than for any previous Honda Type R model. 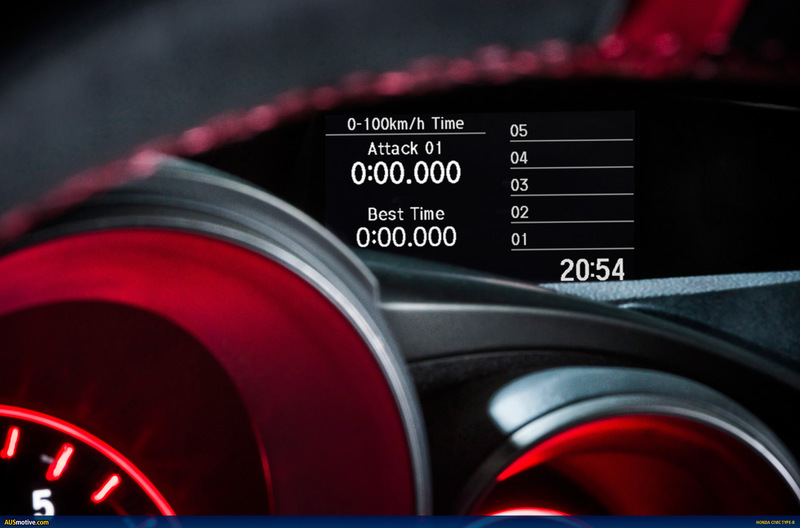 The Civic Type R’s blistering performance is unmatched in the front-wheel drive hot hatch segment: the 0-to-100 km/h (62 mph) sprint is covered in just 5.7 seconds* – making it the fastest accelerating performance front-wheel drive hatchback – and top speed, where permitted, is a class-leading 270 km/h (167 mph)*. The new engine is mated to a slick-shifting six-speed manual transmission, safeguarding an intimate, rewarding connection with the drivetrain, and power is directed through the front wheels. The styling changes that are unique to the Civic Type R give the car an aggressive, purposeful stance, yet almost all have a functional purpose. 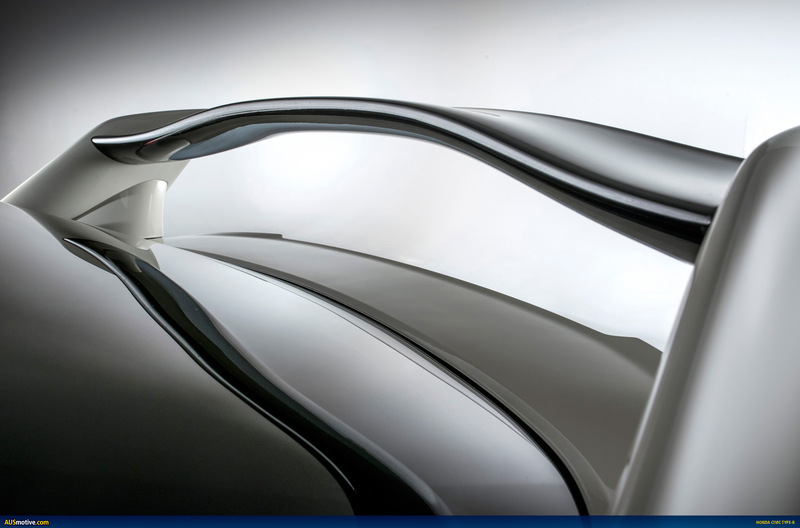 The sleek and aerodynamically-efficient design reflects a car developed to perform at speed. The focus on aerodynamics has ensured high-speed stability and high levels of downforce. To achieve this aim, the Civic Type R was subject to exhaustive aerodynamic analysis, testing and development. The development team tirelessly pursued its objectives through computer-based CFD modelling and wind tunnel testing at Honda’s dedicated automotive motorsports facility in Sakura, Japan; home of Honda’s Formula One engine development. This development work was validated through extensive prototype testing both on the road and on track, including at the Suzuka Formula One circuit, the Nürburgring Nordschleife and at the company’s Takasu test facility. 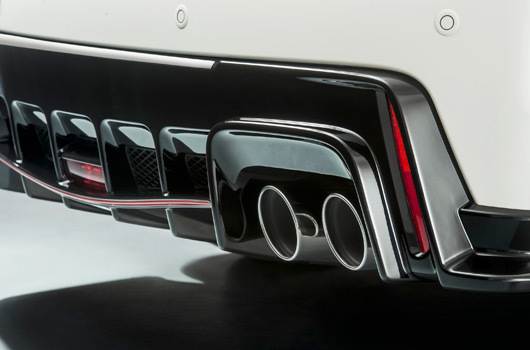 A new, almost completely flat underside aids airflow under the vehicle and combines with a rear diffuser to optimise downforce – effectively ‘sucking’ the car onto the road. The rear wing has been reimagined from the Type R Concept. The structure of the airfoil – its angle, height and shape as well as its vertical end plates – have been carefully engineered to optimise downforce without causing a significant increase in drag at higher speeds. This helps improve road-holding abilities, particularly through high-speed corners. A wide front splitter and deep side skirts also manage airflow and reduce lift, while the front bumper has been shaped specifically to inhibit air turbulence around the front wheels, enhancing high-speed stability and reducing lift forces. Heat management was another major focus for the design team, influencing several prominent external design modifications. Enlarged upper and lower grilles in the front bumper allow greater volume of cooling air into the engine bay. The airflow is channelled to outlet vents above the wheels on the front quarter panels and vents at the trailing edges of the widened front wheel arches to provide greater cooling and ventilation for the high-output engine. 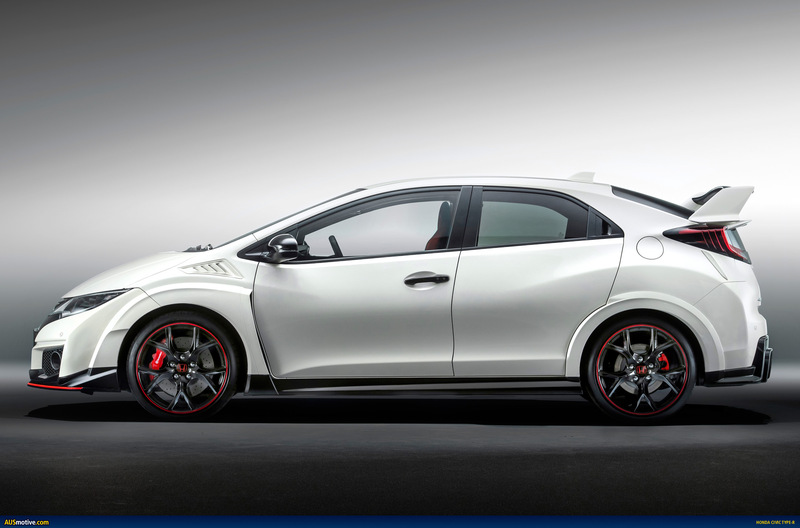 New lightweight, high rigidity 19-inch alloy wheels, unique to the Type R, complement the visual changes. 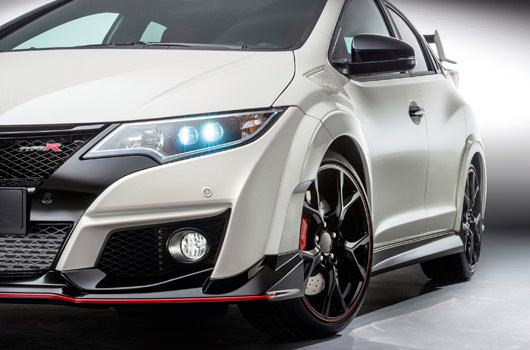 They fill the enlarged wheel arches with 235/35R19 tyres that were developed specially for the Type R.
To help the driver manage the Type R’s prodigious power, the car is equipped with a high performance Brembo brake package, developed specifically for the car. At the front, four-piston calipers apply braking force to 350 mm drilled discs. 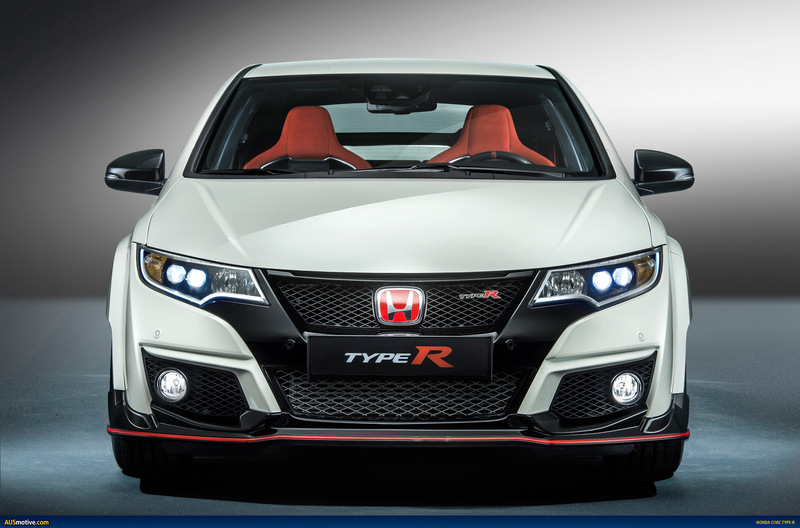 The Type R is available in five distinctive colours that give the purposeful new styling added visual impact. As well as Championship White – shared with successive generations of iconic Type R vehicles – buyers can choose from Crystal Black (pearlescent), Polished Metal (metallic), Brilliant Sporty Blue (metallic) and Milano Red. 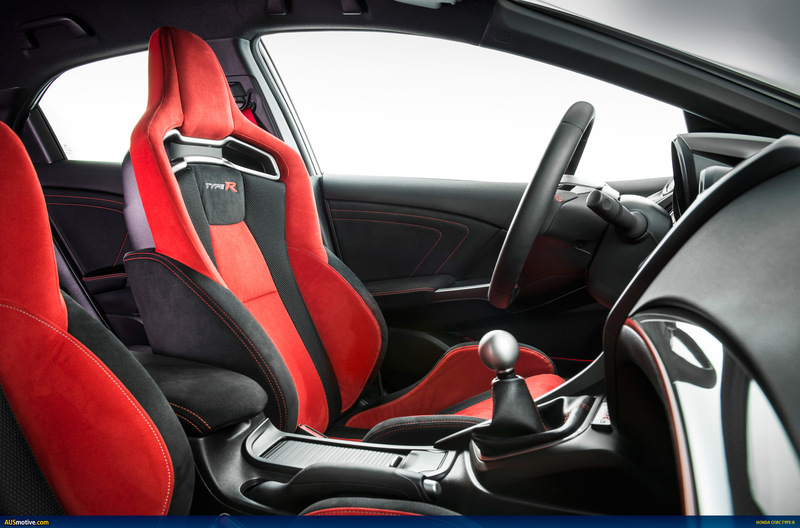 A range of aesthetic and functional upgrades within the cabin reinforce the Type R’s sporting character. As with previous Type R models, the gear lever knob is made from machined aluminium alloy. High-backed sports seats, trimmed in suede-effect black fabric with red double stitching, provide driver and front-seat passenger with ample lateral support during harder cornering. Matching red double stitching also appears on the black leather-clad steering wheel and black gear-lever gaiter. The roof-lining is trimmed in black fabric, augmenting the focused ambience. A number of innovative new suspension systems, unique to the Type R, have been introduced to produce rewarding handling characteristics and to maximise power transfer to the road. 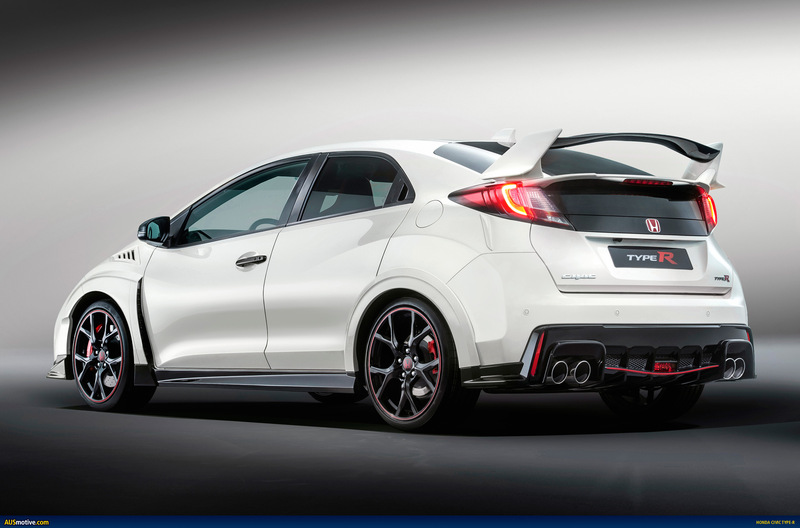 A new four-point Adaptive Damper System, developed specifically for the Type R, enables continuous independent control of each wheel to deliver exceptional road holding performance, limit wheel-load transfer during sharp acceleration and deceleration, and to maintain a stable, flat ride. It also means that the ride is more comfortable and supple in everyday driving and cruising. An advanced Dual Axis Strut Front Suspension system helps to reduce torque steer by 50 per cent compared to the standard Civic’s suspension set up, enhancing high speed stability, on-the-limit cornering and steering feel. At the rear, Type R’s H-shaped torsion beam suspension is constructed with a bespoke ‘crushed pipe’ which improves rear roll rigidity by 180 per cent, further enhancing stability in high-speed corners. These systems are complemented by Dual Pinion Electric Power Steering, which helps to deliver rapid yet linear steering response and abundant feel. The new Civic Type R will mark the debut of the new ‘+R’ button that increases the response of various chassis and drivetrain systems. The result is an even more intense driving experience, ideal for the track and sure to be appreciated by the genuine sports-driving enthusiast. When +R mode is activated, engine responsiveness is heightened, with torque-mapping changed to a more aggressive and performance-focused setting. Steering receives reduced power assistance and is therefore more responsive to driver inputs, and basic damping force from the new four-point Adaptive Damper System is increased by 30 per cent. This means the behaviour of the car is firmer and more agile for high-performance handling. 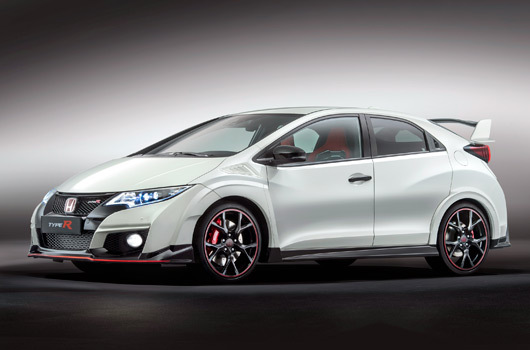 Customers will have the option to specify their new Civic Type R with an all-new GT Pack. Externally, the GT Pack adds signature red highlights to the front and rear splitters for even greater eye-catching impact, but it’s under the skin where the GT Pack’s most significant upgrades will be found. The driver will benefit from extra convenience features such as front and rear parking sensors, dusk sensing headlamps, rain sensing automatic wipers and electric fold door mirrors. Integrated Garmin satellite navigation (including four years of free map updates) is added to the Honda Connect infotainment system. Audiophiles will be attracted by the addition of a CD player and a premium eight-speaker, 320 watt stereo system upgrade. All occupants will appreciate automatic dual zone climate control air conditioning, and sophistication in the cabin is also boosted by red ambient lighting. The GT Pack also includes Honda’s Advanced Driver Assist Systems. This comprehensive suite of sensor-based safety technologies includes Forward Collision Warning, Lane Departure Warning, Traffic Sign Recognition system, High-Beam Support System, Blind Spot Information and Cross Traffic Monitor. Honda’s City-Brake Active system will be fitted as standard on the Civic Type R.
The all-new Honda Civic Type R will go on sale across Europe from this summer. Full vehicle specifications will be announced in due course. Nice numbers Honda, but I’m not in my twenties anymore to drive ricers like this. I’ll stick to the RS275R thanks. So you’ve bothered to comment that you’re too old for this sort of car Pops? SURELY this will elicit landslide changes to Honda’s global product and marketing strategy. It’s not a very attractive car is it. I know the Type R is supposed to be function over form, but surely the desingers could have made a car that is more aesthetically pleasing. In any case the AWD terrors coming out (Focus RS) will destroy the FWD Type R, and look better doing it too. Oh dear. I want to love this car so much but it already looks old. Honda is such a dumb company for so many reasons. They have this amazing Japanese racing heritage yet they choose to build the NSX in the US, the Civic Type R in the UK and tarnish their build quality with cars built in Thailand. A bunch of execs at Honda need to be fired and soon. Jul 30, 2015: AUSmotive.com » Just how good is the Civic Type R?